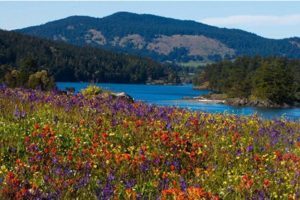 Spring is an especially good time to go visit one of the many gems of the San Juan Islands – the Yellow Island Preserve! 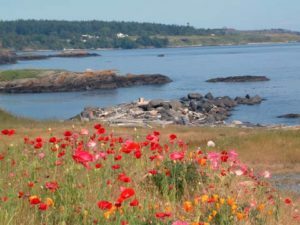 Although the 11-acre island preserve can be visited year round, spring is when the island at is most glorious, carpeted with an array of colorful wildflowers. Truly a dream comes true for professional and aspiring photographer’s and artist’s alike! Before the arrival of Europeans, the island was used by the indigenous population for harvesting plant foods such as the roots of the camas flower. Intentional burning kept the tree population in check, helping to maintain the prairies needed for camas. 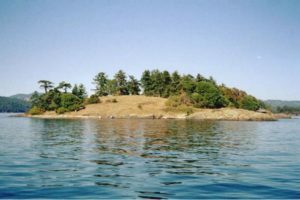 Lewis and Elizabeth Dodd bought the island for $8000 in 1947, and sold it in 1979 to The Nature Conservancy, who administer it as a nature preserve. The Nature Conservancy continues to maintain this island, protecting this beautiful and unique ecosystem. Ongoing ecological research on the island has focused on understanding the extent and rate of invasion of non-native species and developing strategies to restore native species. Results are shared with partner organizations and agencies to help maintain and restore grasslands in other regions of the Puget Sound lowlands; this includes periodic controlled burning of the grass to discourage larger vegetation from taking hold, and creating a flora unique among the lesser-developed San Juan islands. The native grasslands on Yellow Island are unique and an absence of grazing has preserved the diversity of native plants. More than 50 species of wildflowers, including broad leafed shooting star and hairy Indian paintbrush bloom on Yellow Island. The only cactus species native to western Washington, the brittle prickly pear cactus, also makes its home on the island. Bald eagles fly majestically above the island’s trees and harbor seals can be found on the rocks off the island’s west spit. Harlequin ducks and the black oystercatcher can be seen in the intertidal zone and mink and river otters are common on the island too. Further out in the nutrient-rich waters surrounding the island, marine mammals such as orca whales, harbor porpoises and sea lions can be seen swimming and feeding. 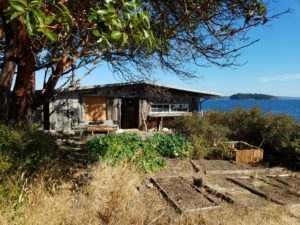 Visiting rules for the Island are very specific: no pets, no picnics, no camping or overnight moorage, no smoking, no water, no public bathrooms. Walking is encouraged, but only on the established trails. 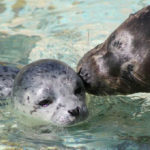 Some beaches close for seal rearing, so boaters need to be aware. The preserve is open daily from 10 a.m. to 4 p.m., hours which are strictly enforced so that the wildlife gets a break from people. 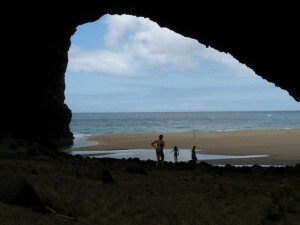 Groups larger than 6 should request special permission to visit the island. Please contact the Conservancy at (206) 343-4344 for written permission. In 2018, Nature Conservatory naturalist Phil Green retired after spending 19 years as the solo steward on Yellow Island. Hired in the summer of 2019, Matt Axling is the new steward on Yellow Island, but unlike the previous steward, Matt brings his family along! Matt is responsible for maintaining the unique Yellow Island prairie ecosystem, monitoring the Marine Protected Area around Yellow Island and welcoming visitors. He draws on his background in environmental education and outdoor recreation to implement conservation and stewardship projects that are based on science and achieve tangible results. Before coming to the Nature Conservancy, Matt ran outdoor education and environment education programs for urban youth in Seattle and Albuquerque. He has led trips throughout the Pacific Northwest, American Southwest, Norway and Argentina. He comes from a long line of islanders with multigenerational ties to Bainbridge Island and the San Juan Islands. In his free time, Matt enjoys kayaking, photography and traveling. Special thanks to Noelle van deer Straaten, Nature Conservatory Volunteer for providing most of this information contributed to this blog! You never know what you might see while exploring the San Juan Islands. Sure, you’re likely to see fabulous sunsets, nature trails and the occasional pod of orca whales. You usually wouldn’t associate the islands with movie stars and music legends, but apparently they enjoy the islands just as much as everyone else! 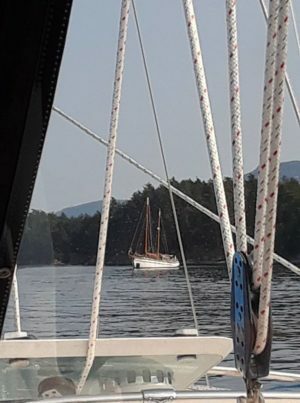 We’d just hunkered down in Echo Bay on Sucia Island when Ron recognized a very distinctive historic wooden sailing yacht in the harbor. I suppose only a true fan such as Ron would recognize the WN Ragland, a 105 year old, 101-foot Baltic trading vessel, as being owned by the one and only NEIL YOUNG. Just at sunset, with the blood moon soon to rise in the east, we were on our way back from checking our crab pot out in the bay. Glancing over at the Ragland we saw a group of people gathered at the stern of the ship. Upon returning to our sailboat, curiosity got the best of me so I trained my binoculars over to their vessel. What I saw was unmistakably a woman in a white dress standing with a man before what could only be described as an officiant. Moments later, they embraced and a cascade of petals showered over the couple. We fired off a few fuzzy photos, feeling strangely paparazzi-ish. We concluded that we had probably been the only ones to witness the wedding ceremony of the legendary Neil Young and actress Daryl Hannah. We decided that out of respect for the artists and what was obviously a very intimate ceremony, we would not try to publicize what we had witnessed. Over the next few days and weeks, we occasionally skimmed the gossip headlines, but not a peep about the wedding! Finally last Monday we finally started reading headlines “Neil Young and Daryl Hannah reportedly marry.” Only a few of the articles mentioned that they “also got married on Young’s yacht somewhere near the San Juan Islands.” Now that the couple has gone public (and confirmed what we saw) we felt that it was appropriate to share what we had observed. 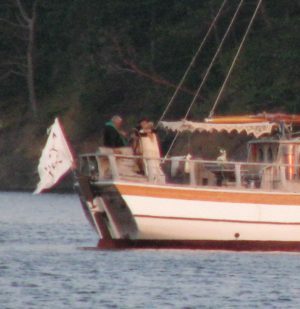 As Neil Young is Ron’s all-time favorite artist, it is all the more exciting to realize that aside from the wedding party themselves, we were probably the only people in the world to witness their nuptials against the striking backdrop of the beautiful San Juan Islands we call home! Click the link below to hear Ron’s KISM radio podcast! New and Improved for the 2018 Season! Working Hard to Enhance your San Juan Islands Sailing Experience! We’ve added new layer of luxury to Diminuendo for your sleeping comfort. Imagine waking to the smell of freshly brewing coffee. And taking the time to enjoy a morning cup in the comfort and privacy of your own spacious cabin! Because your comfort is our goal, we continuously strive to add new upgrades and innovations to Diminuendo to enhance your overall charter experience. 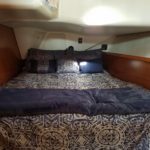 This year we are pleased to announce the addition of custom-cut 7 inch latex mattresses in each of our aft cabins, topped off with luxurious three-inch jell memory foam toppers. All combined, we feel this will provide a level of comfort found in the finest hotels – or maybe as nice as your bed back home. 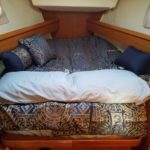 We’ve also spruced up the cabins this year with new comforters, sheets, and towels, introducing an all new look in jewel tones of gold and navy. We also had the mast un-stepped over the winter – a process in which the mast is removed with a crane so Ron could install a new wind vane, anemometer, LED anchor light, and upgrades to the wiring. Last but certainly not least, Diminuendo has been outfitted with a brand new suit of sails (main and genoa) and new running rigging (lines). 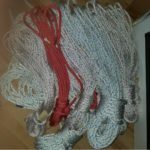 We put the new sails and rigging to the test on our first charter of the season in March. Captain Ron’s grin would indicate that all meet with his seal of approval! There are still some great dates open on our calendar, so you’re invited to come and check out the improvements for yourself. We’ll see you aboard! Winter is still here but today a beam of light pierces the clouds. 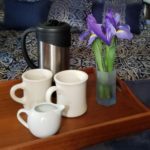 Spring will soon be here and with it another cruising season for the crew of Diminuendo and their guests. It is often said that nothing can heal your soul that traveling and it has come quite true for many. In fact, traveling has cured many from depression, anxiety, loneliness and mental illnesses. So, if you are one of those who loves to travel and see the world then you must try visiting islands by cruising. Yes this sounds quite interesting. Cruises are a great way to have a comfortable and luxurious holiday and taking trips to different islands on a cruise will definitely bring you close to the nature. Here is a list of seven exotic islands you must see by cruising. Enjoy the post! This is one of the most popular islands in the world. We have watched a lot of Hollywood movies where the exotic beauty of the islands of Tahiti has been shown. Now you can visit this island on a cruise ship. The amazing weather condition makes this island a paradise for surfers and vacationers. While you are visiting the island on a cruise make sure you attend the Tahitian dance festival which happens in July. The Heiva festival of Tahiti attracts thousands of tourists. This festival features the traditional art, crafts, culture, dance and other performances by the natives of the islands. If you are a surfer then you should visit the islands between May and August. A lot of travel agencies offer cruise to the Tahitian Island. All you need to do is book one of them as per your convenience. island then look out for the cottage, lodges or even the treetop houses for accommodations. If you wish to see an active volcano on a remote island then Tanna in Vanuatu is the best place for you to visit. Since this is a remote island it is best to go there by a cruise ship. Mt. Yasur is the most popular attraction of the island. However, you can also enjoy the nature at its best with rainforests, hot springs and the coffee plantations. If you are coming on a cruise ship then you can stay here for a day enjoying the village life as well as the serene and secluded beaches. You will be getting down at the port Lenakel from where you will be taken to the village for accommodation. 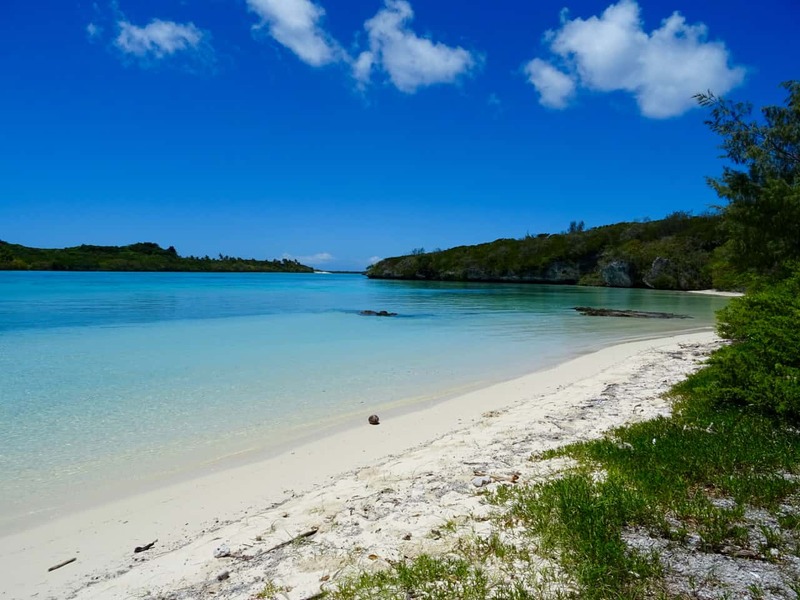 The Ouvea Island in New Caledonia is one of the newest hot spots for sunbathers. The beaches are perfect for getting the perfect tan. You can reach this island on a cruise ship. This tiny French territory is situated in the South Pacific. Thus you may take a cruise ship from Indonesia to this remote island. You may need to search for the cruise companies who ply to and from the Ouvea Island. Fiji is one of the best places that you can plan your vacation to and Laucala Island is one of the most luxurious islands of Fiji that is located just off the coast of another island named Taveuni. This tiny island is only 12 square kilometres and has some of the most luxurious residences and restaurants to cater to the tourists. You can take a ship from Fiji to Laucala Island, check out this beautiful and exotic island and come back by the end of the day. Please do try the water sports while you are in this island. If you are planning a cruise vacation in the South Pacific, then you should not miss the Vava’u Islands in Tonga. Tonga is a Polynesian country which has clusters of beautiful and exotic islands tucked away from the hustle and bustle of the modern world. It is so remote that you can actually swim with the humpback whales on this island. You can make special arrangements with the tour operators of the island to go for a swim with the whales. Or you may anyway watch them while you are cruising. you can stay on this island for a day or two to enjoy nature’s bounty. The island of Rarotonga is one of the most popular wedding destinations on The Cook Islands. The in the recent times, destination weddings have made this island quite popular and expensive. However if you are taking a cruise in the South Pacific ocean then you can embark on this island for a day and look around for the natural flora and fauna that thrives best here. The island is only 32 square kilometres in size. Now that you have this list of some amazing island destinations, you can plan your cruise holiday accordingly. It is quite evident that you would not be bored and will have a great time enjoying the people, culture, and food of these exotic islands. 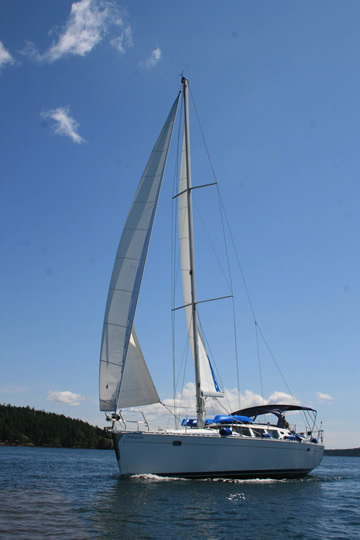 June is a great month for sailing the Washington San Juan Islands! Want in on a little secret? 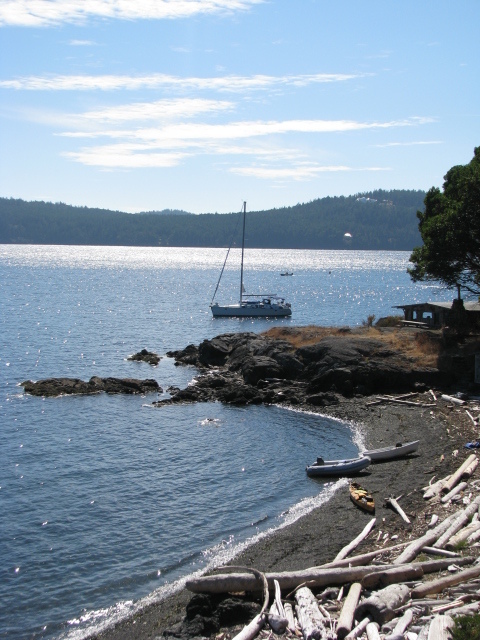 June is arguably the best month for your sailing adventure in the San Juan Islands. Why? Statistically, the average winds in June are around 7 knots, making for pleasant sailing conditions. You’ll find the temperate climate most comfortable, with daytime temperatures averaging around 68 degrees Fahrenheit (20 degree Celsius). Located in the Salish Sea where they lie in a rain shadow, the San Juans are blessed with around 250 days of sunshine annually. Moist marine air from the Pacific Ocean sheds most of its moisture on the Rainforests of the Olympic Mountains and mountainous Vancouver Island before reaching the San Juans. In fact the San Juans receive only about half the rainfall of Seattle, a mere 90 miles to the south! With the Summer Solstice falling on June 21st, the days are the longest of the year, even longer than the “high season” months of July, August, and September! This allows ample daylight hours to enjoy hiking, beachcombing, or kayaking when we arrive at our destination for the day. Although never crowded, with the summer yachting season yet to begin and many schools still in session, the islands are even more tranquil during the May and June shoulder season than the high season of July, August, and September. The southern resident population of Orcas (killer whales) may be found in the San Juans any time of year but they are often joined by the transient population by May or June, increasing the likelihood of spotting these magnificent creatures. Humpback, Minke, and occasionally straggling Gray Whales are also sometimes spotted. 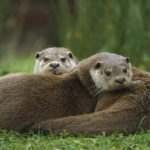 You’re also likely to see some adorable baby seals and otters on the shorelines.